Many of my readers are also writers or speakers--or aspiring writers. I recently found a new book by Yvonne Wu that breaks down the value (and the ins and outs) of blogging for author's or public speakers seeking to promote their personal brand and work. 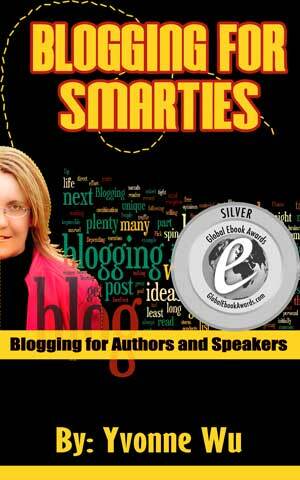 What did I think of Blogging for Smarties by Yvonne Wu? Quick Summary of Blogging for Smarties: The Internet is often the first place that people turn to for information about anything and anyone. Company addresses, information about a person, and reviews about a company are a click away. Potential visitors rely on the Internet to learn about specials, book releases, events, and information. Your website is your storefront and it enables you to reach a global market. Having a website that supplies this information is a necessary component of running a business. As an author and speaker, the Internet becomes a business channel to network, advertise your products and services, and build a following on a global level. Learn how to create your first blog, effectively market your blog and create passive income opportunities in our new ebook, “Blogging for Smarties Blogging for Authors and Speakers,” which will walk you through the steps of building an extremely effective website. Wouldn’t it be nice if you did not have to struggle or depend on someone else to do it for you? Blogging for Smarties Offers the Basics--to Anyone. This guide is short, sweet, and straight to the point--but, covers the value of blogging from identifying the need to creating a marketable, viable brand through some steps which will aid that creation. As Yvonne Wu touches on a lot of information; readers should expect to use this book as a launching point into building blogging efforts. It isn't a one-stop, inclusive guide--but, it's a great resource to get you started in building your name as an author--and the author offers a list of additional resources to venture into as you learn more. Would I recommend Blogging for Smarties? This is a great resource for authors or professional speakers (or current bloggers) looking toward building a blog and other marketing strategies for their work. It's also an informative piece for beginning bloggers. Wu offers a great starting point--and has more in-depth books on the subject as well as videos. If you are simply at the "I am not sure what I need to do to get started" point--this book may help you venture onto new ground for your personal brand. Or if you have been blogging for a while already--there are sections on beginning monetization and podcasting that offer new tips and ideas as well. This is the "short" edition of the author's guide--without videos. I do think most readers would benefit from the video add-ons and a more detailed guide from Wu. She has a very straightforward "teaching" and writing style that made the website creation/blogging world seem much less intimidating. Buy Blogging for Smarties, Short Edition. Yvonne Wu, president of The YP Publishing, provides services tailored to professional speakers and authors, helping them with marketing themselves in person and online. Yvonne has assisted authors with a wide variety of projects across North America, helping them with publishing and promoting their book .Yvonne is a Book Award Judge. Yvonne was a Stevie Awards for Women Judge and WebAward Judge. The 6th Annual Shorty Awards nominated The YP Publishing as #10 in the small business category of the Shorty Awards, She is a graduate of the Author Assistant Program, Business Administration Marketing and Speaker Assistant Program.